John Kasich, Republican Governor of Ohio, defied his Republican legislature, and especially its Tea Party rump, and found a way to expand Medicaid coverage to 275,000 poor Ohioans. 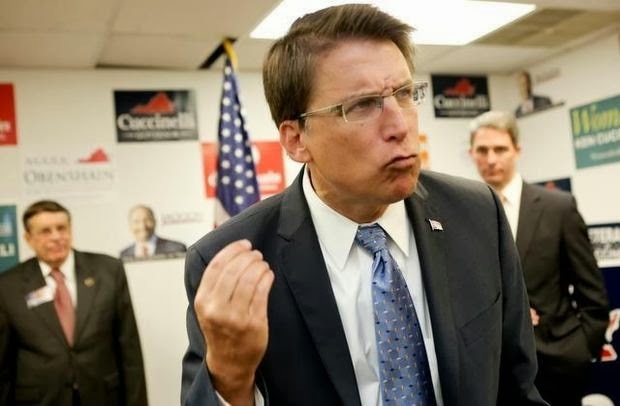 Pat McCrory, Republican Governor of North Carolina, refused yesterday to reconsider his Republican General Assembly's decision not to expand Medicaid coverage to a half-million poor North Carolinians. One of those decisions was the moral thing to do, to help people who can't help themselves. The other was an indefensible choice that can only be explained away if you really do believe that more money in the pockets of rich people is a greater good than medical insurance for poor people. Meanwhile, rural hospitals are on the verge of closing because of lower Medicaid reimbursements, and half a million uninsured people in North Carolina are finding out they're too poor to qualify for federal subsidies for coverage under the Affordable Care Act. Failure to expand Medicaid will certainly lead to more suffering for many and to premature death for some. They talk about God incessantly, those Republican in Raleigh, but given a choice of following the example of Jesus Christ, they decide that is simply "out of the question." Off topic, I know, but when will you post something about the information going around town about Mena/Templeton/Long/Milner meeting weekly on campaign strategy, and calling themselves "the Masters"? And this is the SAME John Mena who, I believe, claims he'd prefer to have dealings with the Taliban than with the Templetons! Wait, the masters thing is serious and not a joke? Please tell me anon that it was a joke. If not how did you hear about that one? Not a joke. Apparently an open secret among the Yates-Templeton group. I heard because this is a small town and not everyone agrees with the way that group is running things. It's Boone...people talk.